You can write a note to your declawing veterinarian and ask them to please stop doing this inhumane and mutilating procedure to cats and if they don’t, then you can take your business to a humane veterinarian in your area. Here is an idea of a note you could send them. You also could send it to other declawing veterinarians in your area to see if they would do the right thing and be on the right side of cat history to stop doing this inhumane procedure. I have been a loyal client of yours for many years and am so thankful for all that you have done to help care for my pets. As you know, they mean the world to me, which is why it is important they have the best veterinary care possible. It is not my intent to offend your practice of medicine but I do want to insure that when it comes to care of my cats, I choose a veterinarian who is competent and compassionate and will advocate on their behalf. It is important to me and your clients to know that you are not biased toward your canine patients. Are you a veterinarian who will advocate on behalf of cats, like you do for dogs? If a client called you up to ask to have all of their puppy’s teeth removed because they were tired of the destructive chewing, would you do it? If a client called you up to ask to have ten of their kitten’s toes amputated because it is going to be kept strictly indoors and is scratching their furniture, would you do it? What if the owner of the puppy told you that unless you did they would have it put to sleep? Would you remove the teeth? The answers to these questions will help me to understand your philosophy when it comes to the care of all your patients and whether or not you are the right veterinarian for the care of my cats. So many veterinarians now are finally having the heart to do the right thing and are no longer declawing anymore and their practices are thriving more than ever. Especially since many pet owners like me are looking for humane vets to take their business to. Some vets are even joining the PawProject.org and helping to repair the paws of declawed cats in need. 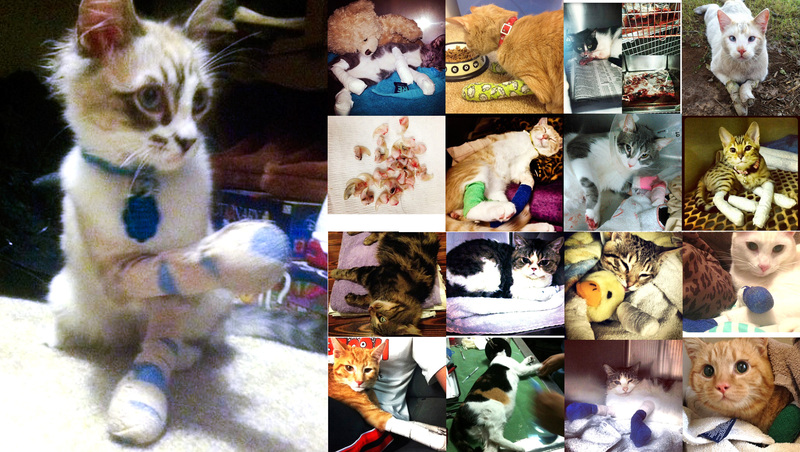 The PawProject.org, CitytheKitty.com and declaw.com sites have a long list of no-declaw vets. It would be wonderful if you would stop declawing and add your name to the list too. Recently Denver, Nova Scotia, Alberta, P.E.I, Newfoundland and Labrador, and British Columbia have banned declawing. The veterinarians in those Provinces in Canada say that declawing is unethical and mutilating. They are basing their decision on facts about this inhumane procedure. There are new studies that show that no matter how a cat’s toe bones and claws are amputated, it always harms the long term health and well-being of a cat. Also, VCA Canada banned declawing in all their 93 vet practices. I strongly urge you to educate yourself more on the real impact this procedure has on cats. I guarantee it will change the way you see your role in declawing forever. When your practice does commit to helping and healing cats and preventing and relieving their suffering I will gladly return as a client. Until then, I will entrust the care of my cats to a more humane, ethical, and caring practice.